I'm expecting a baby this summer! So my latest project is working on putting together a nursery for my baby girl. I decided to go gender-neutral with the overall design and all the major purchases because this is our first child, and who knows, there may be a boy using the same nursery in the future. I am calling this design "Fantasy Forest". Valspar wall paint, "Blue Whisper"
I already had a few items I wanted to work into the design: the crib, my white dresser (for a changing table), the yellow night stand, and the white tree curtains. The "BEFORE" picture of the mostly-empty bedroom, from several angles. Then at Emerald City Comicon I found this amazing illustration by Brittney Lee and had to buy a print for the nursery. It coordinates perfectly! To solidify my color palette, I found a picture of a nursery that used the green, blue, yellow, and turquoise colors very effectively in a gender-neutral design. I love how the yellows and pinks pop against the light blue wall. Who says light blue has to be a boy color? So I ran with it. Isn't it pretty? The room is so much brighter now. My dad did most of the work because he knows what he is doing. I helped! The room is still a work in progress, I've got three months to go! Create a "Nursery" board on Pinterest. Do a search for "nursery" and start pinning everything you like. Eventually you will be able to spot trends on themes and colors that really speak to you. Create 1-3 new boards for the themes that most appeal to you and move those pins to those new boards. The two themes that spoke to me were woodland/forest and Star Wars (and other nerdy nurseries). Add inspiration images to your themed nursery boards (keep generic "nursery" pins in your "Nursery" board). These inspiration images could be color palettes, scenic photography, artwork, or merchandise, anything that fits your theme and potential colors. Decide on general theme and color palette. Expect that your theme and colors may get more refined as you purchase items, so this may need to be flexible. Purchase/pick out the big items (crib, changing table/dresser, glider/rocker chair). An unexpected sale on an amazing crib may throw your color palette off, so if you can get the big items early, this will help you tweak your design as needed. Don't know where to start? 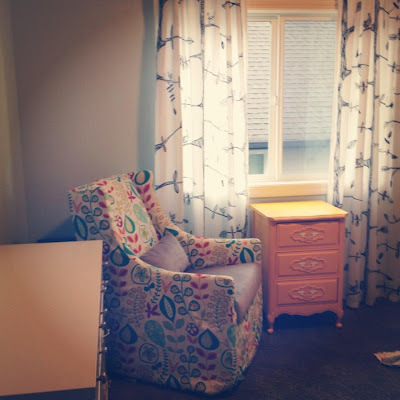 Create a "Nursery Furniture" board on Pinterest and start pinning pictures (including the price and linking back to the item). When you find one you like or plan to purchase, move that pin to your themed board to see the image alongside your inspiration images. Copy images of your furniture and decor items from your Pinterest board to Microsoft OneNote* and organize your furniture around the room layout. If you have a picture of your room, add it to help you visualize the space. Use the Online Room Planner by Urban Barn to figure out your furniture layout (don't forget to copy a picture of your layout into OneNote as well). * OneNote is great for organizing text and images all in one place. You can copy and paste from your browser, and can resize and drag things around easily. I created several OneNote pages, including design images copied from Pinterest (to help solidify the color scheme), a visual layout (above), color scheme details with paint color names, and even a list of furniture items with measurements. Pick out your paint color and paint the room! This color should be influenced by your inspiration images and should coordinate with the furniture and decor you have picked out already. Lastly, move your furniture in, set up the crib, and pick out the rest of your decorations. Curtains, crib sheets, storage baskets, a pouf, toys, and other small coordinating items can be added to your Baby Registry.